You are currently browsing the category archive for the ‘socks’ category. Last year, I dyed a custom colorway for the science fiction convention Boskone, and it was such a success that we decided to do it again this year. Priscilla Olson of the Boskone committee and I designed a colorway that was inspired by the dark hard SF written by this year’s Guest of Honor, Alastair Reynolds. I’m calling it Star Field, and here is how I make it. First, I wind a skein of Sterling yarn into a ball. 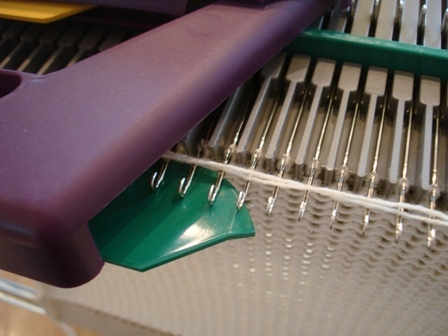 and machine knit a rectangle using both ends of the ball of yarn. The result is a knitted sock blank, a canvas to paint on whatever I choose. 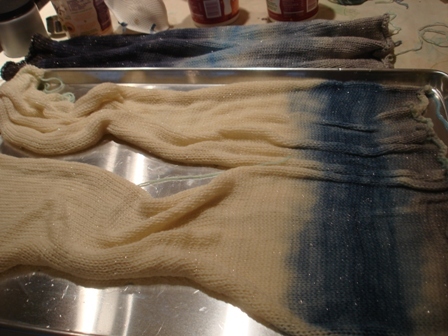 Two finished sock blanks — next steps are steaming, cooling, rinsing, drying. 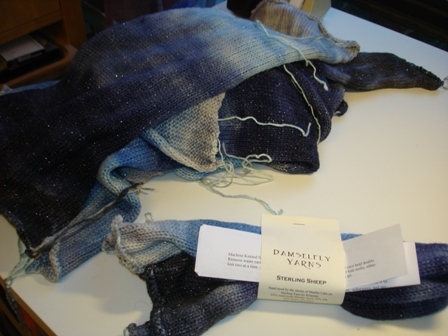 In the Damselfly Yarns fulfillment area (the nice table in my office) the finished blanks are labeled. Here’s a view of three blanks, laid out so you can see the full effect. Since the blanks are knitted double, socks can be knitted that have identical gradations of colors. 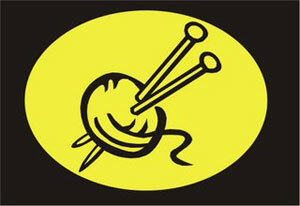 Or, a scarf can be knitted that will be palindromic: each end one color, shifting evenly to another color in the middle. This will be available at Boskone in Boston , February12-14. They will selling them for the low, low price of $25 — such a deal! After the convention, I will stock Star Field in my Etsy shop for $30. Up in the Sky — the Knit-Signal! What’s that glowing in the night sky? or Tricoteuses Sans Frontières, which sounds even cooler. If you make a donation to Doctors Without Borders and let Stephanie know, you become a member of Knitters Without Borders and are karmically entitled to use the badge and enjoy that warm fuzzy feeling. Stephanie also draws names of folks who have let her know they’ve donated and distributes some swag to them — I’ve offered some of my hand dyed sock yarn for that as well. I’ve split our donation between them and CARE, but there are many other fine organizations helping the people of Haiti cope with this horrific disaster. 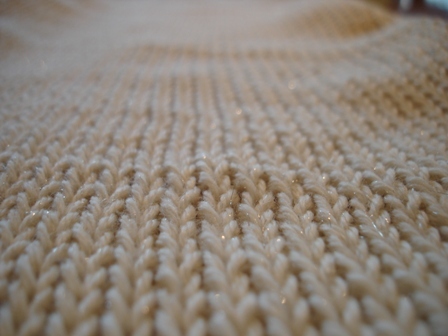 I hope that you can add a stitch or two into the sweater of aid that the world is putting together. We are now one month away from Sock Summit, and preparations are definitely moving into high gear. Base yarn is on perpetual re-order, and I mutter grumpily about how Kraemer’s Sterling yarn is out of stock until too late. 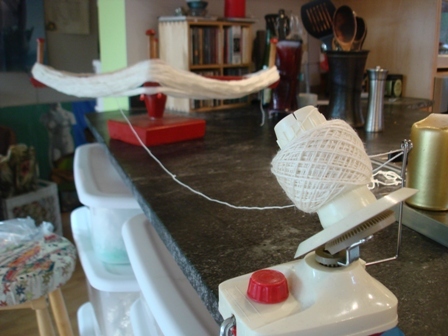 The near-constant use of equipment is taking its toll in the studios of indie dyers from coast to coast. First, Jennifer’s second best dye-pot blew up, then one of my Rubbermaid soaking tubs developed a crack that slowly leaks water. The thin grey line in the middle of the picture? Leaky crack. I can still use the basin for soaking and washing dyed yarn if it’s in the sink, but next time I’m at Fred Meyer’s Wall o’Rubbermaid I’ll need to get a replacement. Available in my Etsy shop, of course! We had a run of lovely warm weather, so the roses have been happy. Here is a bloom of Just Joey, a lovely apricot rose with a delightful scent that thrives in the Northwest. No black spot! I’ve been dyeing some self-striping yarn by winding a bigger diameter skein, dyeing 28 inches of it one color, and the remainder another — when knitted in a typical sock configuration, you get one row of the first color, followed by two rows of the other. There are various ways of doing this, but here’s a particularly fun method and colorway that I’ve developed. First I make a very hot vinegared dyebath in a purple that I’ve mixed from red and blue dye. The longer section of the skein goes into this while I’m holding the shorter section out of the water. 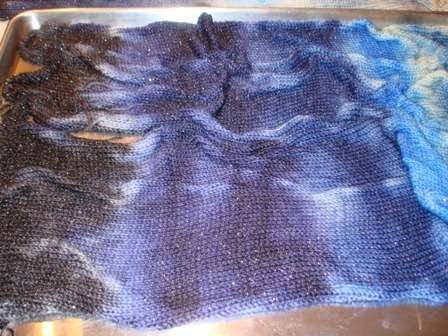 The red dye and much of the blue strikes on the skein as purple, but there is some blue left in the dyebath. 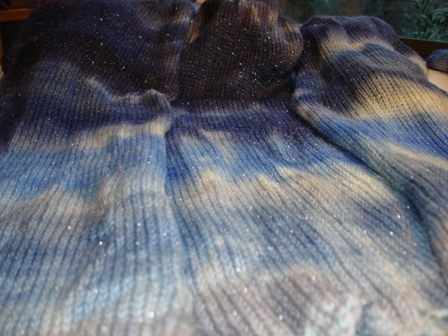 Dropping in the remaining undyed section of the skein allows it to start soaking up the blue. The purple section is still taking up a little of the blue as well. This makes for a very interesting and nuanced purple. 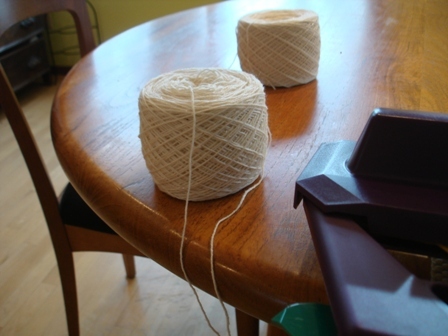 Since I wanted to reuse the pot of water, I then steamed the yarn to make sure the dye got throughly fixed. Here’s the skein as it’s cooling down after steaming. A bonus is that there’s still a little blue left in the dyebath, because I didn’t let the skein cool in it and absorb those last few molecules of blue dye. So I can take another skein of yarn and drop it in to soak up those last bits. It’s a prettier pale blue in person, and may stay that color, or get overdyed to deepen the color. So many choices! I finished the small sock that I started on World Wide Knit in Public Day. It’s another Wee Tiny Sock, done with no changes this time, just simple and easy. Nothing quite matched it in the garden at the moment, but it goes nicely with this purple something-or-other. I now have three tiny socks. Sock Summit lasts 4 days, so perhaps I need a different sock pin for each day? The pink striped rose is now in quite full bloom, and it scents the whole front yard. You don’t even have to take time to smell the roses, they come and get you! But taking a moment to stick your nose into a bloom is just divine.